United States President Donald Trump and North Korea’s leader Kim Jong-un are scheduled to kick off their historic summit Tuesday in Singapore. With the eyes of the world upon them, here is a breakdown of how the day will unfold. 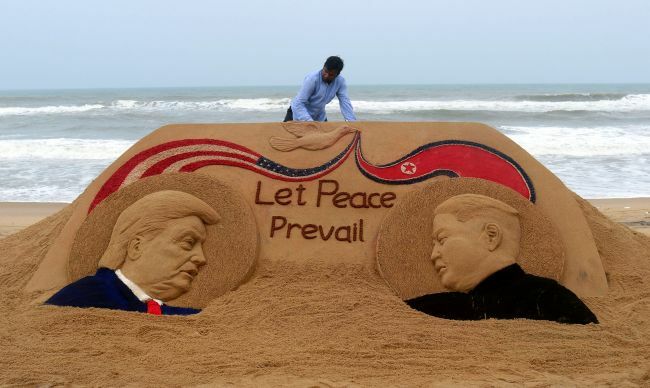 The first-ever meeting between a sitting US president and a North Korean leader is to kick off at 9 a.m. Tuesday at Capella Hotel on the resort island of Sentosa in Singapore. Trump announced plans to leave early for the summit site. Starting off with a handshake, the one-on-one bilateral meeting is to start at 9:15 a.m with only the translators in attendance. Then aides to Trump and Kim will join the two leaders for an expanded bilateral meeting at 10 a.m. The US side is expected to include State Secretary Mike Pompeo, national security adviser John Bolton and chief of staff John F. Kelly. Working lunch is scheduled for 11:30 a.m. The White House said Trump would hold a media interview at 4 p.m. before departing Singapore via Paya Lebar Airbase at 7 p.m. Some media outlets have suggested, citing US sources, that Kim will leave at 2 p.m. The reclusive leader broke away from summit preparations Monday evening for a mini-tour, including a night-time stroll on the Singapore waterfront. He even posed for selfies with Singapore’s Foreign Minister Vivian Balakrishnan as he toured a series of major sites in the city state.